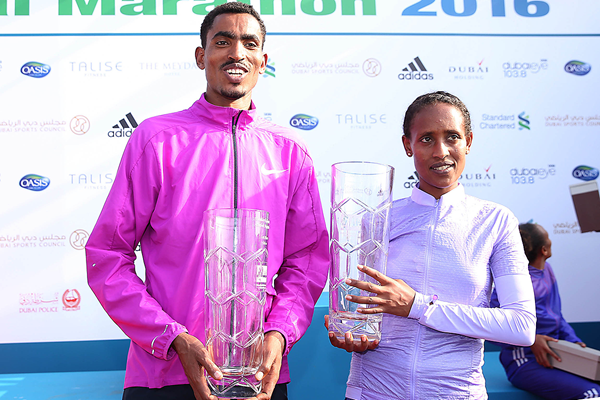 Dubai: Ethiopian runners stole the thunder clinching the top five places in both men’s and women’s race of the Standard Chartered Dubai Marathon. 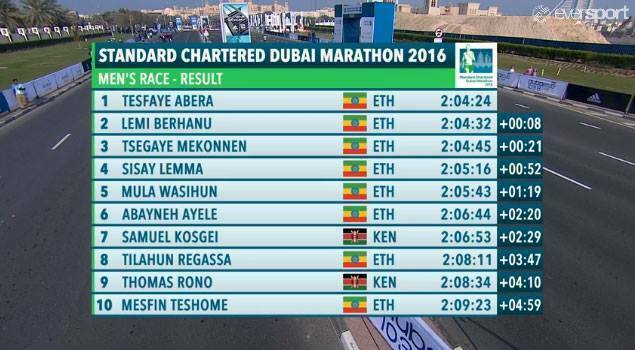 Tesfaye Abera Dibaba of Ethiopia emerged as the new winner of the Dubai Marathon with a timing of 02:04:24 followed by last year’s winner Lemi Berhanu Hayle with a timing of 02:04:33. On Friday, an estimated 100,000 people participated in the 2016 Dubai Marathon (there were 30,000 registered runners) while spectators lined the streets to cheer them on. The first set of racers took off while it was still dark, at 6.30am on a cold Dubai morning. Dibaba broke his own record when he won the Mumbai Marathon in January 2015 by clocking 02:09:46:14.
segaye Mekonnen Asefa finished third at 02:04:46. In the women’s race, Ethiopia’s Tirfi Tsegaye Beyene produced a sterling performance to win in 02:19:41 followed by Amane Beriso Shankule with a timing of 02:20:48. Meselech Melkamu Haileyesus finished third at 02:22:29. In the men’s race Ethiopia’s Sisay Lemma Kasaye finished fourth at 02:05:16. Mula Wasihun Lakew clinched the fifth place at 02:05:44. 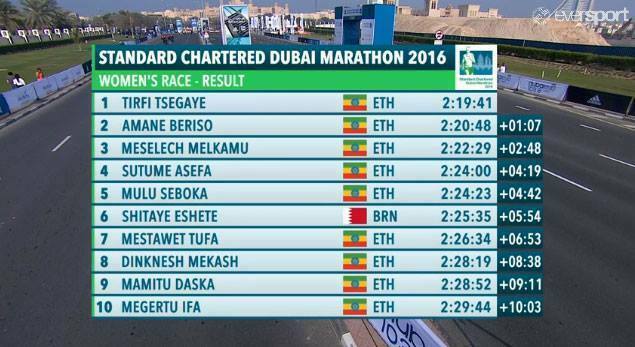 Even the sixth place finish was by an Ethiopian Abayneh Ayele Woldegiorgis at 02:06:45. The best by a Kenyan was Samuel Kiplimo Kosgei, who finished seventh, at 02:06:53. 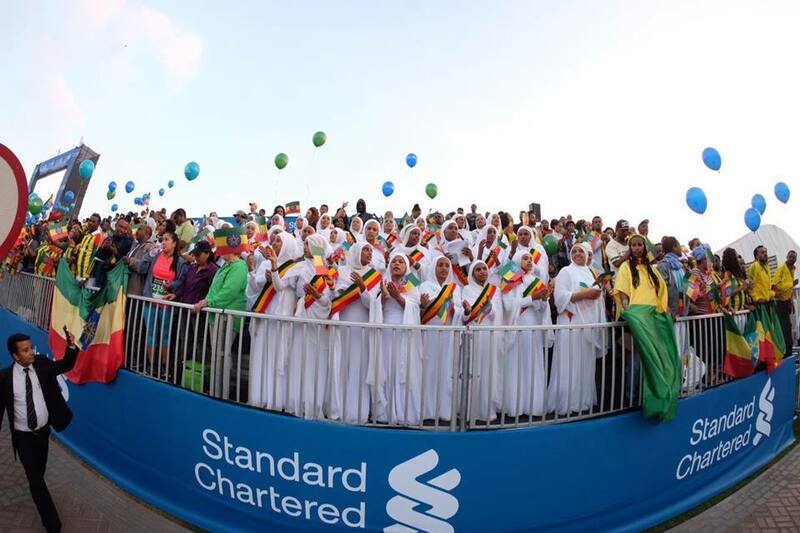 In the women’s race, the fourth place was also taken by Ethiopians Sutume Asefa Kebede with a time of 02:24:00 and fifth by her compatriot Mulu Seboka Seyfu at 02:24:24. Bahrain’s Shitaye was the best after Ethiopian women at sixth with a timing of 02:25:36. 5) Mula Wasihun Lakew 2:05:44. 5) Mulu Seboka Seyfu 2:24:24. Until 2014, Dibaba was a 15- and 21-km runner. In January 2015, he won the Standard Chartered Mumbai Marathon on his maiden marathon run in India leaving his rivals — including several Kenyans and compatriot Dereje Debele =- in his wake at the 32-km mark to storm to the finish in 02:09:46:14.